Periapical x-rays are one of the most recommended and used x-rays in the field of dentistry. They are the basics in the field of dental radiographs and are used to a great extent in several branches of dentistry in order to ensure that the procedures are done well and the teeth are not harmed in any form. 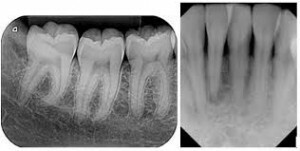 Periapical x-rays are very easy to shoot in the radiograph room and can be processed easily in the dark room thereafter. This ensures that there is a lot saving of time on daily basis for the dentists and the dental teams. Even the patients are in great comfort due to less time utilization for the radiographic procedure. Patient co-operation is achieved easily during the process of shooting periapical x-rays. Both the children as well as adult patients can get their periapical x-rays done. Most of the times when the patients complain of pain which is related to the pulp of the tooth then the dentist diagnoses with the help of the periapical x-rays. Various lesions around the apex of the teeth can be diagnosed well in the x-rays. The best part is that in these type of x-rays less number of teeth are targeted and therefore a clearer view of the particular teeth can be seen which makes the diagnosis very simple and easier for the dentist. The x-ray exposure for the patient is quite controlled and therefore the health of the patients is not affected in the long term. The focus in this type of x-ray is usually on the pulp and the areas surrounding the apex of the teeth which is in pain or injured. In this way, the diagnosis is fine and focused for the patients without any kind of interfering structures in the x-rays. The treatment is then done according to the priority of the patients oral condition.